Chuck Berry said the audience kept him going. Upated March 29 — The funeral for Chuck Berry will take place on April 9. A visitation open to the public will be held from 8 a.m. to noon at The Pageant Concert Club, 6161. Delmar Blvd., St. Louis. It will be followed by a closed funeral service for family and close friends. Berry, the legendary singer, songwriter and guitarist who duck-walked his way into rock and roll history, died March 18. He was 90. Mr. Berry, a naturally gifted artist, tried on, discarded and mixed musical styles as easily as a pit crew changes tires, until, in the mid-'50s, he settled on what would become known as “rock 'n' roll.” He received the lion’s share of credit for developing the new genre: an indiscriminate coupling of blues and country music, with a generous kick of rhythm. The mercurial artist wrote and performed scores of rock and roll masterpieces that were coveted by generations of musicians, including The Rolling Stones, whose first hit was a cover of Mr. Berry’s Come On, in 1963. Few bands have recorded as many of Mr. Berry’s songs as the Stones, and no one was more grateful for the opportunity than the Stones’ guitarist Keith Richards. Richards was the presenter when Mr. Berry was inducted into the inaugural class of the Rock and Roll Hall of Fame in 1986. The coda for the man dubbed the poet laureate of rock 'n roll came on Saturday, March 18 in St. Charles. Police were called to his home and found an unresponsive man. Mr. Berry began singing in the Antioch Baptist Church choir in St. Louis when he was 6. But he chose a decidedly non-sacred song to perform at his Sumner High School talent show: Jay McShann’s Confessin' the Blues. The somebody done somebody wrong-song elicited a raucous response. It made him determined to hear that thunder for the rest of his life and for the next six decades, with a few brief detours, he did. In 1952, when jazz pianist Johnnie Johnson lost his saxophonist, Alvin Bennett, to a stroke on Christmas Eve, he called on Mr. Berry to join the Sir John Trio. Ebby Hardy was the drummer. The group played at the popular Cosmopolitan Club in East St. Louis. Although he was a novice guitarist, Mr. Berry added vocals and showmanship to the group and was soon its leader. During a 1955 visit to Chicago, Mr. Berry waylaid Muddy Waters after a show to ask for recording advice. The blues legend suggested he try Chess Records. Mr. Berry sent them four demos; one was Maybellene. He got the contract. The high-octane Maybellene became his first single. The song combined two of Mr. Berry’s favorite topics: fast women and fast cars. It climbed to No. 5 on Billboard’s rock 'n' roll singles chart, a pop chart long dominated by white artists. The civil rights movement was just dawning and Mr. Berry’s music smashed the color barrier. According to his Hall of Fame biography, he attributed his crossover appeal to clear diction. “The pop fan could understand what I was saying better than many other singers," he said. He wrote as distinctly as he sang, using an economy of words to convey a time, a place, a feeling. With crisp, slice-of-life lyrics, he layered country and western guitar licks over a steady base of rhythm and blues. The result was a string of hits that followed Maybellene in rapid succession. He challenged the supremacy of the classics with Roll Over Beethoven in 1956, and paid homage to the new genre with Rock and Roll Music in 1957. In the fall of that year, he went on tour with the Biggest Show of Stars for '57, which included Buddy Holly and the Everly Brothers. In the song’s original version, Mr. Berry referred to himself as a “colored boy.” He changed the lyrics to “country boy" to better appeal to white audiences. Mr. Berry, who was born at 2520 Goode Ave. in St. Louis, was neither poor nor from the country. He grew up in the heart of a solidly middle-class neighborhood, but the part about becoming famous – well, that was prescient. He continued to rock steady, accompanied by Johnson and the Chess house band, but he was nearly two decades removed from Maybellene when he had a playful song filled with double-entendres go to the top of the pop charts. In 1972, My Ding-A-Ling reached No. 1. It was his first and last single to do so. Mr. Berry appeared in several '50s rock 'n' roll movies, including Rock, Rock, Rock!, Mister Rock and Roll and Go, Johnny, Go! In 1987, his self-titled autobiography was published and the enduring movie about his life, Hail! Hail! Rock 'n’'Roll, was released. 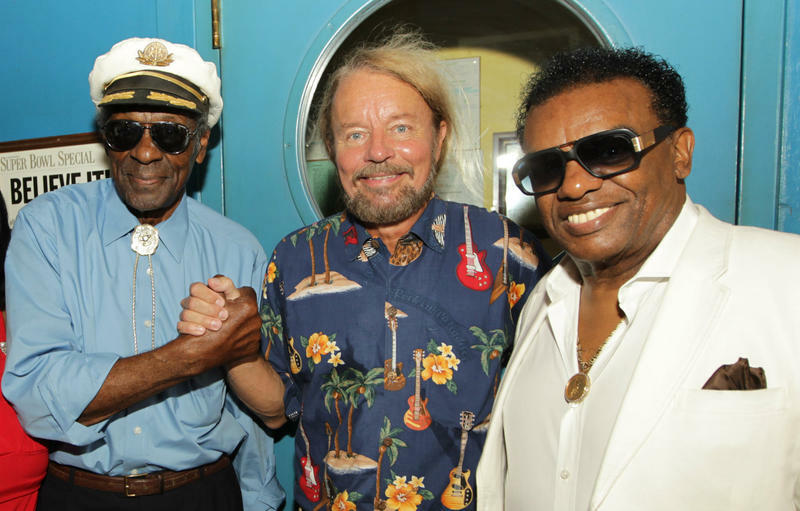 The only thing more fun than dancing to a Chuck Berry tune was watching him perform. Sometime during each performance, he could be counted on to crouch low and, perfectly balanced on one leg, scoot rhythmically across the stage while playing the guitar. He claimed to have accidentally discovered the move as a child while trying to retrieve a ball from underneath a table; his family’s delight encouraged him to keep it up. The “duck walk” had its public unveiling during Mr. Berry’s first performance in New York in 1956. Determined to not look like rubes, for their big-city debut he purchased three pairs of brown suede shoes and three rayon suits that wrinkled so badly in the suitcases they appeared to be seersucker. They simply borrowed irons and hit the stage. Mr. Berry’s first album was After School Session in 1957. One of the album’s most popular songs was Brown Eyed Handsome Man. It was also a good description of the tall, lean, always perfectly coiffed singer, who favored a captain’s chapeau when his pompadour thinned in later years. He had the talent, the looks and the showmanship for stardom; he had to develop the business acumen. Mr. Berry believed himself to be “a fair wizard at math in high school and could eyeball the dance houses to estimate attendance,” so he realized early on that his paymasters were shortchanging him and his band after they played to packed houses. He later found that many of his royalties were missing as well. By the time he and Johnson stopped performing together in 1973, Mr. Berry had become savvy about the business side of music. He sometimes got advances on future royalties and required full prepayment for performances. Traveling with nothing but a guitar, promoters had to provide a backing band. It cut expenses to the bone and gave a lot of up-and-coming musicians, like Bruce Springsteen and the E-Street Band, a chance to work with a master. “Now it was five minutes before the show was timed to start. The back door opened and in he came. And, he was by himself. And, he’s got a guitar case. And that was it,” Springsteen said. Mr. Berry proceeded directly to the promoter’s office, presumably for his advance fee, and was soon on stage. He left as unceremoniously as he had arrived. The two teamed up again in 1995 to perform Johnny B. Goode at the Concert for the Rock and Roll Hall of Fame in Cleveland. The summer before his junior year at Sumner High, Mr. Berry and two friends decided to head for Hollywood. They got as far as Kansas City before running out of money. They went on a crime spree, robbing a bakery, a barbershop and a small clothing store. The robberies netted them $145. After their car threw a rod, they resorted to carjacking to raise money to get back to St. Louis. Instead, they were caught by the police and Mr. Berry spent the next three years in a reform school near the men’s penitentiary in Jefferson City. While there, he organized a quartet. In 1959, Mr. Berry was sentenced to two years in prison for hiring an underage girl to work in his St. Louis nightclub. Mr. Berry believed racism was behind the charge and his attorney, Merle Silverstein, agreed. In a biography of Mr. Berry titled Brown Eyed Handsome Man, Silverstein called the judge “one of the greatest bigots of all time,” noting that he had used the “n” word in court. After serving less than two years, Mr. Berry returned to music and recorded another of his most popular songs, Nadine. Mr. Berry appeared as himself in the 1978 film, American Hot Wax, and performed at the Carter White House in 1979 – shortly before heading for a three-month stay at a California prison camp for tax evasion. He performed there too – to a standing room-only audience. Late in life, he plea-bargained out of an embarrassing charge of videotaping women in the ladies' room of his restaurant. 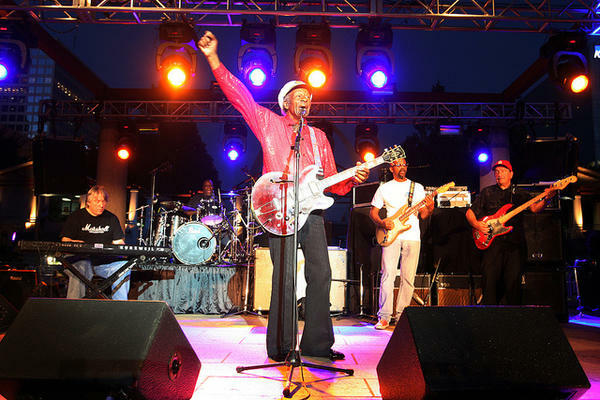 Mr. Berry had not recorded any new music since 1979, but his concert schedule continued unabated. Nothing was able to derail what became one of the most enduring, most illustrious careers in music history. A career that transcended time and racism, and outlasted hardship, began accruing overdue recognition in the '80s. In 1982, he was inducted into the Nashville Songwriters Association International Hall of Fame. In 1985, he received the Lifetime Achievement Award at the 27th Annual Grammy Awards and was inducted into the Blues Foundation’s Blues Hall of Fame. More than 40 years after getting his first taste of audience adulation, Mr. Berry became a member of the first class of inductees into the Rock and Roll Hall of Fame. He took up residence there in 1986 with the likes of Ray Charles and Jerry Lee Lewis. Two years later, he got his star on his hometown’s Walk of Fame. Despite becoming an international superstar, St. Louis had remained Mr. Berry’s anchor and his home. Since 1996, he had returned to perform almost every month in the Duck Room at Blueberry Hill in the University City Loop. His Duck Room-sets were backed by bassist Jim Marsala, keyboardist Bob Lohr, drummer Keith Robinson and two of his children, guitarist Charles Berry and vocalist/harmonica player Ingrid Berry-Clay. A larger than life statue – 8-feet to be exact – of Mr. Berry was installed near his star, across the street from Blueberry Hill. in 2011. 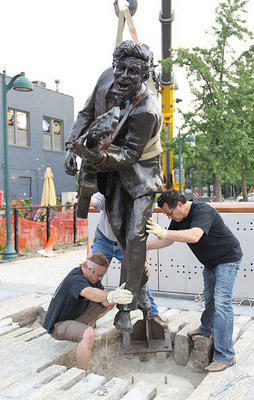 Designed by Harry Weber, the statue, like the Walk of Fame, was the brainchild of Blueberry Hill owner Joe Edwards, along with KMOX Radio’s Charlie Brennan and St. Louis Post-Dispatch columnist Bill McClellan. In 2000, Mr. Berry received a Kennedy Center honor. In 2003, “Rolling Stone” magazine named him No. 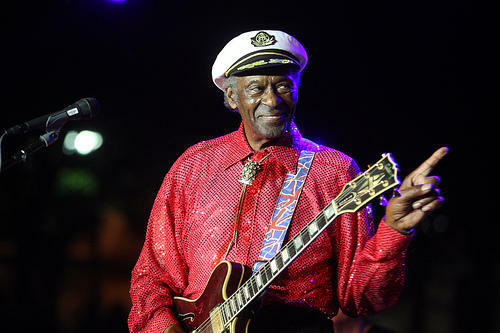 6 six on its list of the Greatest Guitarists of All Time and in 2012, the Rock and Roll Hall of Fame and Museum honored Mr. Berry with its American Music Masters Award. In 2013, he received the Arts and Education Council’s Lifetime Achievement in the Arts Award. It is likely that without Mr. Berry’s influence, there would have been no British Invasion. The Beatles, The Rolling Stones, the Yardbirds, the Animals and many others from the U.K. covered Mr. Berry’s songs. Even the Beach Boys got in on the fun, until Mr. Berry successfully sued them for copyright infringement. Their 1963 hit Surfin' U.S.A. appropriated the melody and rhythm of Sweet Little Sixteen. Mr. Berry’s most recent award, the Polar Music Prize, aptly states: "Every riff and solo played by rock guitarists over the last 60 years contains DNA that can be traced right back to Chuck Berry." Charles Edward Anderson Berry was born Oct. 18, 1926, in St. Louis and was raised in The Ville neighborhood, then a thriving city unto itself for African Americans. He was the precocious fourth of Martha Bell Banks Berry and Henry William Berry Sr.’s six children. His father was a housing contractor; his mother was a most unusual black women: a college-educated homemaker. He met Themetta “Toddy” Suggs at a May Day festival in Tandy Park. They were married on Oct. 28, 1948, while he was still on parole from reform school. Before embarking upon his music career, Mr. Berry had brief stints as a janitor and hairdresser. He also worked for his father's construction company and part-time with his uncle, Harry Davis, a professional photographer. He briefly toyed with the idea of following in his uncle’s footsteps. Mr. Berry was preceded in death by his parents. He survivors include his wife ,Themetta Berry (Suggs), and his four children, Ingrid Berry, Melody Eskridge, Aloha Isa Leigh Berry and Charles Berry Jr.